Soundsuits. Photo by James Prinz Photography. Courtesy of the artist and Jack Shainman Gallery, New York. There’s a chance you’ve seen Nick Cave’s work in Vogue, where his famous Soundsuits were featured in a generous photo spread, modeling high-end fashion accessories. His work is also found in the collections of the MoMA, the Brooklyn Museum, the Hirshhorn, and the Detroit Institute of Arts. Now, Nick Cave returns to his alma mater, Cranbrook Art Institute, for his most ambitious project to date. Here Hear is a muscular show featuring 50 multimedia works, but much of this art was never intended for museum display only. 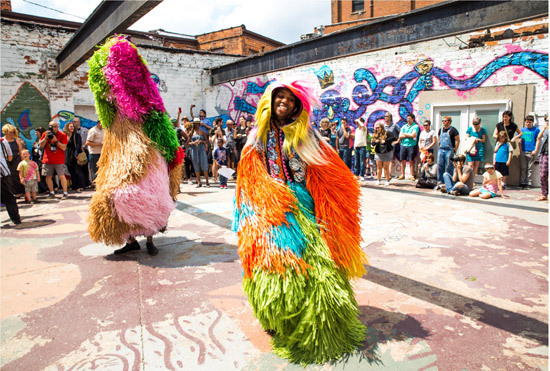 Nick Cave draws inspiration from the city of Detroit, and he takes his art to the streets. Central to the show are his sculptural Soundsuits, which defy easy description. They resemble large head-to-toe costumes, often evocative of traditional African ceremonial regalia. Many repurpose found objects of personal, sentimental value. Vintage tin toys, for example, are a recurrent theme. When set in motion by a dancer, the suits create noise. Cave associates noise with protest, and the Soundsuit serves as a metaphor for making the voice heard. His first was created in response to the 1991 beating of Rodney King and subsequent acquittal of the officers. For Cave, the Soundsuit was also a literal way to mask racial and class distinctions and stereotypes. At Cranbrook, thirty wildly colorful Soundsuits are elegantly showcased on a large podium and look something like haute couture from another planet. In an ambitious series of dance performances and photo-shoots that continue into October, Cave and his Soundsuits are making appearances at some of Detroit’s most iconic locations. Performances have already occurred at the Fisher Building, the Michigan Assembly Plant, and Heidelberg Street (home of the famous Heidelberg Project). One performance occurred in Brightmoor, a neglected neighborhood derisively referred to by some as blightmoor. Cave and his dancers, momentarily transformed the space into one of celebratory joy. As performances continue to occur, they’ll be documented in a book called Greetings from Detroit, offering a positive counterpoint to the incessant barrage of images presenting Detroit as a ruined city. Back at Cranbrook, a side gallery screens video of these performances which plays alongside a mural-sized map of Detroit which charts where the performances occurred. 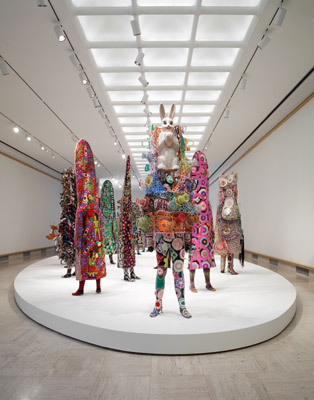 Installation photo from the Nick Cave: Here Hear exhibition at Cranbrook Art Museum. Photo by PD Rearick, 2015. In addition to the Soundsuits, Cranbrook is showcasing a series of recent sculptures in which Cave offers commentary on race in America. In one particularly resonant use of re-contextualization, viewers encounter Sea Sick, a series of found paintings affixed together like panels on an altarpiece, each depicting a tall ship keeling in high seas. Above these paintings presides an exaggeratedly black figure of a man’s head, mouth open wide, seemingly frozen in a silent scream. The artifact was once labeled as a “spittoon,” and discovered by Cave at a flea market. Juxtaposed with the ships, this vicious object of scorn suddenly becomes an accusatory reference to the trans-Atlantic slave trade. Near the opposite wall is TM 13, a response to the shooting of Trevon Martin, depicting a hooded youth bound by a net like a captured animal. These works connect the demons of America’s past with those of its present, driving home the point that the national discussion on race in America is far from over. Nick Cave manages to address the issues of race and class without coming across as cliché or sermonic. His Soundsuits, joyous and colorful, are a surprising and inventive way to respond to tragedy. They make for a visually striking gallery display in a gallery space, but they’re really at their best when set in motion. Here Hear bursts out of the hushed galleries of the museum, transcending racial and economic barriers to bring a jolt of art and vitality into some of Detroit’s poorest neighborhoods. Cave’s work admirably manages to seem equally at home on the streets of Brightmoor as it does in the glossy pages of Vogue; it really is art without borders.